Experience part of one of Walt’s grander dreams as you listen to the audio of the Kilimanjaro Safaris on the D-COT Jukebox! As mentioned before in our Magic Behind the Music series, when Walt Disney came up with the idea for the Jungle Cruise at Disneyland, he originally wanted to have live animals on the riverbanks, but with the current space, technology, and cost to keep unpredictable animals there, it just wasn’t feasible. But as Walt said, “It’s kind of fun to do the impossible,” and Disney Imagineering has kept moving forward with that mantra ever since. On April 22, 1998, Disney’s Animal Kingdom theme park opened with the Kilimanjaro Safaris as the primary anchor attraction. Guests could board a specially designed safari truck and ride through a re-creation of an African savanna full of Africa’s wildlife. To keep so many animals in one area, the attraction actually takes up 110 acres – that’s 3 acres larger than the entire Magic Kingdom! D-COT’s track was added to the Jukebox on May 12, 2009 and lets you listen in on the 25-minute experience of riding through a savanna packed with 34 different species of African wildlife. In fact, this safari, in many ways, is more adventurous than an actual safari in Africa where tourists wait hours or even days to get a glimpse of some animals in their natural habitat. For this reason and others, this attraction has made its mark on the members of D-COT. Over 280 members have it in their favorites, and it is on 16 custom playlists amongst the D-COT supporters. It has been played over 3,700 times. Due to the fact that this attraction is very sight-driven, and most of the sound is merely in the guide’s descriptions, the excitement of the passengers, and the roar of the vehicle’s engine, this track gets a more modest average rating of 4.2/5 out of 65 votes. Worth mentioning, however, is the tune, “Hapa Duniani” which is a feature of the attraction audio and a separate track on the D-COT Jukebox which makes it into the Top 25 Rated playlist. Fun fact: “Hapa Duniani” is actually the Lord’s Prayer sung in Swahili. Most guests aren’t aware of this, but it still makes for an area-appropriate sound on the ride. 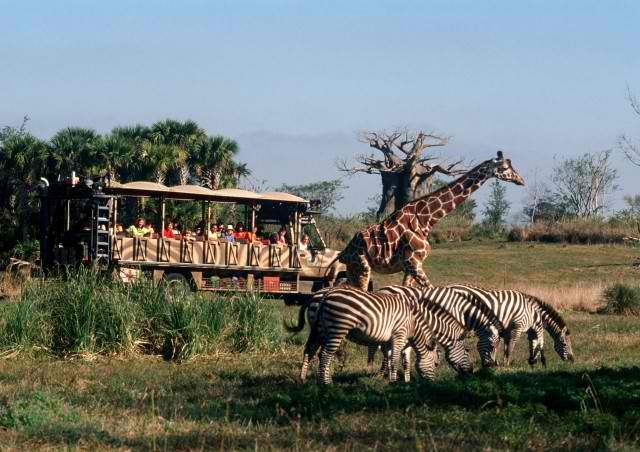 Even with the additions of Expedition Everest and Pandora to Disney’s Animal Kingdom, Kilimanjaro Safaris remains a crowd favorite and one of the primary reasons for visiting the theme park. It is certainly worth seeing first thing in the morning or snagging an afternoon FastPass+ for when the animals are most active. I did not know that about Hapa Duniani! How about that, you told me a tidbit I didn’t know! It’s the first tune in my Animal Kingdom personal playlist and has extra special meaning now. Thanks for the wonderful article! I must say, I really enjoy these so much! Wow!! I did not know this: Hapa Duniani” is actually the Lord’s Prayer sung in Swahili. I only know that about Hapa Duniani because Jet told me before love love love that track! Now I really want to take another Kilimanjaro Safari! Welp… now I know a new one to play in church! Srsly tho — that’s very cool stuff, all around! Thanks for another great article! I didn’t know that about Hapa Dauniani! Very cool! We are taking an African Safari this summer so will have to see how it compares to this ride!